Arrive in dazzling Hong Kong today and embark your ship. Take time to settle in and explore, perhaps admiring the city’s magnificent setting, a glittering forest of skyscrapers standing between soaring mountains, a bustling harbor and offshore islands. Our overnight stay gives you ample time to experience the rich cultural tapestry and unmistakable British influence. Witness where deeply held Eastern traditions meet modern Western sensibilities during a Hong Kong city tour that takes you up to Victoria Peak for sweeping views of the metropolis. Continue to the former fishing village of Aberdeen, now a dense and fascinating cluster of residential towers. Or perhaps you’ll venture to nearby Lantau Island or visit the casino-laden port of Macau, the famous former Portuguese outpost. The East China Sea welcomes you today. In the mid-1800s, British, French and American ships made their way to Shanghai across these waters. As you cruise today, enjoy regional cuisine in the World Café or treat yourself to a massage at The Spa. Visit the fascinating Taiwanese capital of Taipei on the island’s northern shore. This city boasts a curious blend of Chinese, Japanese and Western influences. Visit the National Chiang Kai-shek Memorial Hall, a monument dedicated to the founding father of Taiwan, and the National Revolutionary Martyrs’ Shrine to those who have fallen in China’s wars. You will stop for photos of Taipei 101, a stunning skyscraper that held the reign as “tallest” from 2004 to 2009. 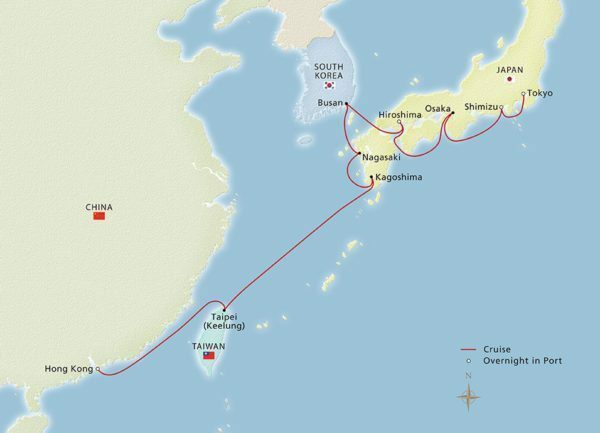 Spend a relaxing day on board as you cruise the East China Sea. Perhaps you will learn about your next destination, Japan, in The Library or at an enrichment lecture. Enjoy a Norwegian-inspired lunch at Mamsen’s gourmet deli. This evening, savor wine pairings with your dinner at The Chef’s Table. Situated on a scenic bay formed by a sunken caldera and overseen by the Sakurajima volcano, Kagoshima is often called the “Naples of the Eastern World” for its setting. During a city tour, head to the hilltop Shiroyama Park for splendid views of the city and of Sakurajima volcano, and visit the Reimeikan museum in the old city castle to view exhibits of Japan’s history and culture. If you wish, you may join a ferry to get closer to Sakurajima volcano across Kagoshima Bay. Call in Nagasaki today, one of the rare cities in Japan where East and West intermingle, most notably in the delicious cuisine. Dutch traders resided here for two centuries after the shogun expelled missionaries spreading their religious beliefs. The city changed forever on August 9, 1945, destroyed by an atomic bomb. Take in views of today’s modern city from atop Inasayama lookout point and pause at the Nagasaki Peace Park to stroll among moving statues. You will also see the Urakami Cathedral and the island of Dejima, built to house European merchants. Visit Busan, South Korea’s “second city” after Seoul and one of the world’s largest ports. Busan has been built on 17 centuries of history, yet its modernity is unmistakable and distinct. Get to know its treasures during a hop-on/hop-off bus tour, stopping along the way to explore bustling markets, beaches, parks and other sights. You may also hop off to spend time at the Busan Museum or the Busan Museum of Art; however, admission is at your own expense. 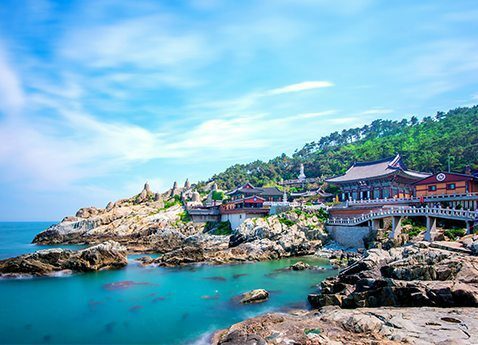 Alternately, journey to the magnificent hillside temple of Beomeosa and the coastal temple of Haedong Yonggung. Arrive in Hiroshima for an overnight stay, giving you time to ponder this resilient city. Once at the forefront of industry and education, it grew from the 19th century to become one of Japan’s most important industrial centers. Its devastation on August 6, 1945 is hard to imagine today, so modern and forward-looking are its streets and its people. Contemplate the decades-long recovery at the burned-out shell of the Industrial Promotion Hall and the Peace Memorial Park. Later this evening, enjoy a tour of the illuminated city by night with a stop for a dinner of okonomiyaki, Japanese soul food and sake. Today, you may embark a ferry to discover the wooded hills and cherished Itsukushima Shrine on the picturesque Itsukushima Island. Widely referred to as Miyajima Island (Shrine Island), it is a UNESCO World Heritage Site. The main portal, a dramatic red torii gate, stands in the surf during high tide. The shrine’s pagoda boasts five stories. If you prefer, you may explore more of Hiroshima on your own, perhaps paying your respects at the Children’s Peace Monument; its Flame of Peace will burn until the last nuclear weapon on the planet has been dismantled. Home to two of Japan’s oldest shrines, Osaka is a pilgrimage site for many devout followers of Shinto. Make a visit to Osaka Castle. Originally built in the 16th century and rebuilt twice since, it is a treasure trove of armory and artifacts. At Sumiyoshi Temple, admire the fine architecture that stretches back 17 centuries, a stark and elegant style with vivid red beams and columns. If you wish, you may journey to Kyoto, Japan’s former imperial city of stunning shrines, bamboo forests and the splendid Kinkakuji Temple (Golden Pavilion). Arrive in Shimizu for an overnight stay, affording you time to get to know this historic city on the shores of Suruga Bay and explore farther afield to the famous Mt. Fuji. In Shimizu, visit the original burial spot of the first shogun, the Shinto shrine of Kunōzan Tōshō-gū. With its flamboyant design and bright colors, it is a testament to the status that these military dictators held in the eyes of the emperor who appointed them. You can view the suits of armor, tachi (swords) and other artifacts and enjoy sweeping views of the Pacific Ocean along the way. You have another day to relax and enjoy the lush natural surroundings of Shimizu. You may also travel to the slopes of Mt. Fuji, Japan’s highest peak. You will ascend to an elevation of 7,900 feet, passing pristine countryside and charming small villages. Pause your journey to view the work of famed artist Utagawa Hiroshige in a museum dedicated to the Japanese landscape master. Call on Yokohama, gateway to Tokyo. Formerly known as Edo, today’s Tokyo is the cultural and economic heart of Japan, residence of its emperor and a fascinating study in contrasts. Explore Tokyo on your own today. Perhaps you will explore Shinjuku Gyoen, a picturesque garden influenced by French, English and Japanese styles. Or ride the city’s famous subway to the Ginza district, Tokyo’s glittering shopping district of neon lights, luxurious shops and bustling coffeehouses, anchored by the Wako store and its famous Hattori Clock Tower. Disembark today in Yokohama and transfer to the airport for your flight home. Or stay on in Tokyo to explore its rich and fascinating culture.